On 7th May 1918, 16 Officers and 665 other ranks were transferred to “K” Infantry Base Depot (IBD) at Calais, whilst the remainder of the Battalion formed into a training cadre of 10 Officers and 44 other ranks. At the same time 15 Officers and 560 other ranks of the 2/5th Battalion were also posted to the IBD at Calais following the disbanding of that Battalion. 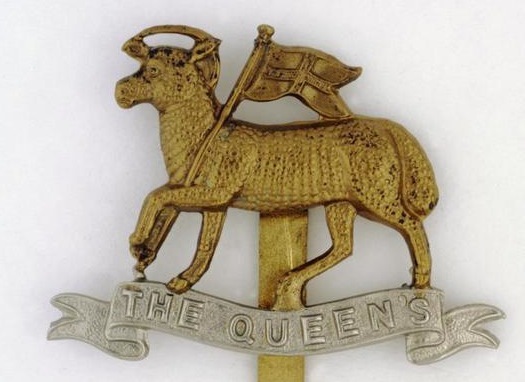 Following the disbandment of the 2/5th and 2/6th Battalions some of the men were compulsory transferred to the Royal West Surrey (Queen’s) Regiment and posted either the 1/22nd or 1/24th (County of London) Battalions (The Queen’s) in August 1918 and allotted new regimental numbers. Army Service Record for John Whetton showing his overseas service with the 2/8th Battalion Notts & Derby until their disbandment on the 28th February. He then transferred with 9 Officers and 198 other ranks to the 2/5th Battalion before being moved to the 2/6th Battalion in April. During April 1918 the 2/6th Battalion received 262 men in 4 drafts (1st: 85 OR; 2nd 71OR; 3rd: 21 OR; 6th: 85 OR). 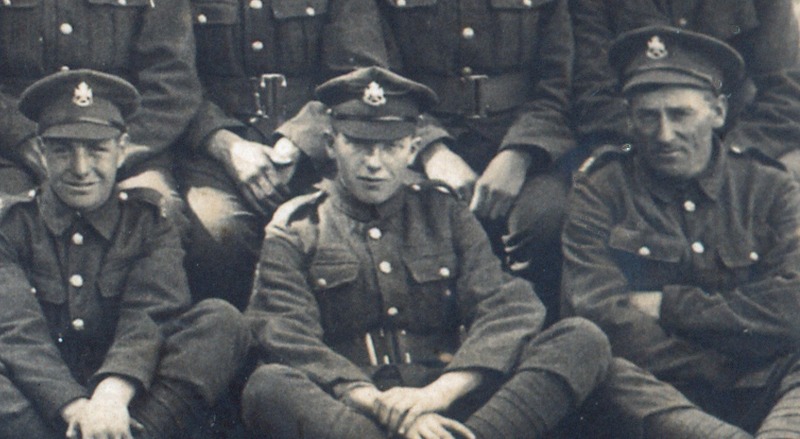 John was finally posted to the 22nd London Regiment on the 25th August 1918 and was wounded in action 5 days later. 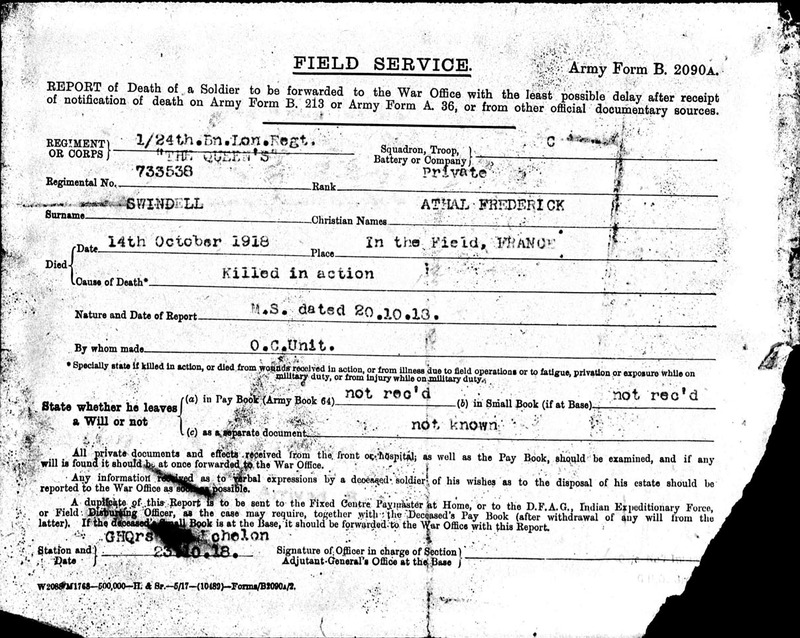 Army Service Record for Athall Swindell showing his posting to the 1/24th (County of London) Battalion (The Queen’s) on the 25th August 1918. A very interesting picture showing a mixed group of Sherwood Foresters and the County of London (The Queen’s) Regiment. It is interesting to speculate that this picture might represent the transfers of August 1918. The two Officers and three NCOs are badges to the County of London (The Queen’s) Regiment. In addition forty other ranks are badged to the Notts & Derby Regiment; possible representing a platoon. Attached is a list of 310 men of the 2/6th (and 2/5th) Battalion that were transferred to the 22nd and 24th Battalions of the London Regiment in August 1918 – London transfers rev. 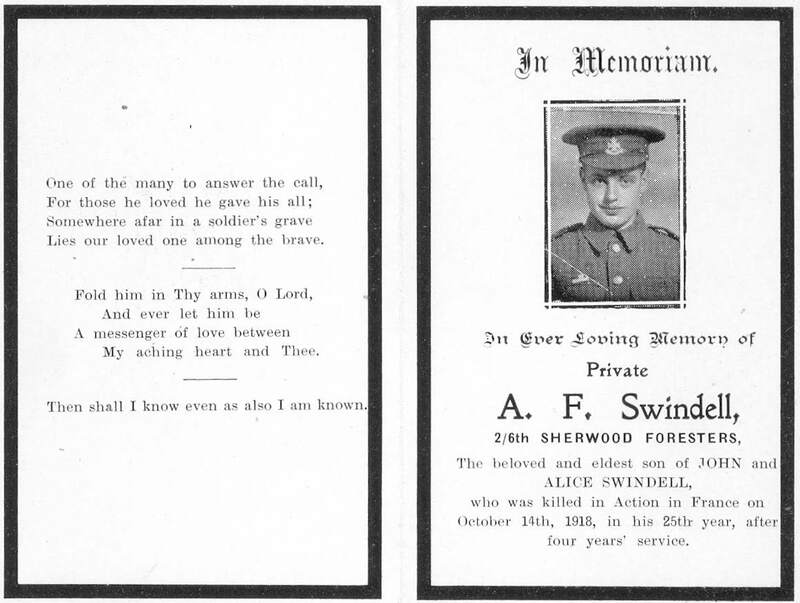 Amongst the men that transferred was 3285 Private Athal Frederick Swindell a 24 year old ex-miner from Killamarsh. Athal had originally enlisted into the 6th Battalion on 24th August 1914. After serving in Ireland he embarked with Battalion from Folkestone on 26th February 1917. After spending two months with the 59th Signalling Company of the Royal Engineers he returned to his unit in June 1917. In March 1918 he was admitted to the 2/2 North Midland Field Ambulance with acute bronchitis, before rejoining the 2/6th Battalion two days later. 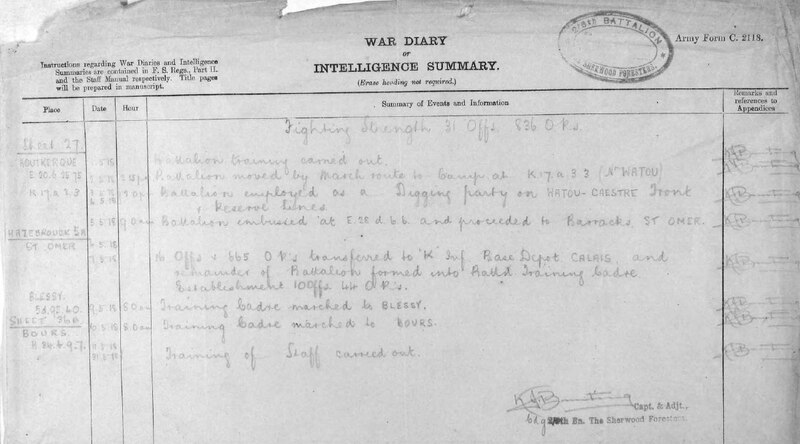 On 7th May 1918, along with 16 Officers and 664 other ranks Athall was transferred to “K” Infantry Base Depot (IBD) at Calais, which was followed by 12 days leave in England. 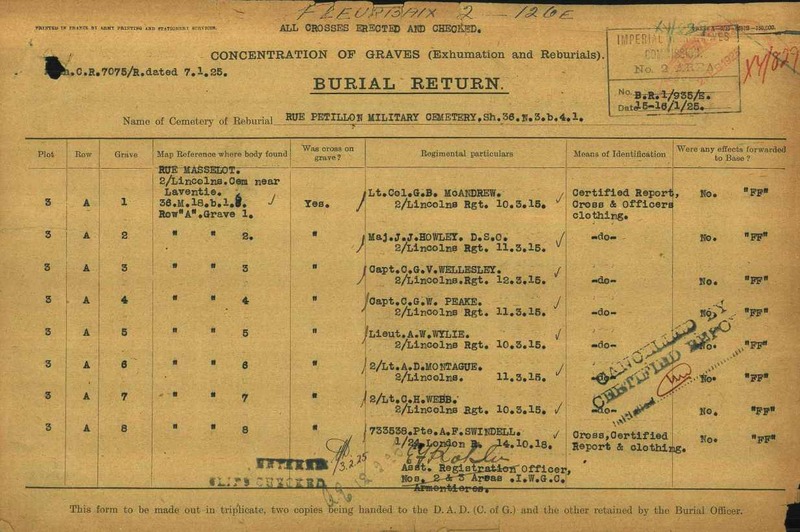 Following his return to France, Athal was transferred to the 1/24th London’s and allotted the new regimental number 733538 and was killed in action on the 14th October, less than a month from the Armistice. He is buried in Rue-Petillon Military Cemetery in grave III. A. 8. Most of the men buried in this plot are Officers of the 2/Lincoln’s who died on the 11th March 1915 during the Battle of Neuve Chapelle. The bodies were originally buried in the 2/Lincolns Cemetery at Rue Masselot near Laventie (36.M.18.b.1.8.) but exhumed in 1925 and reinterred in Rue-Petillon Military Cemetery. 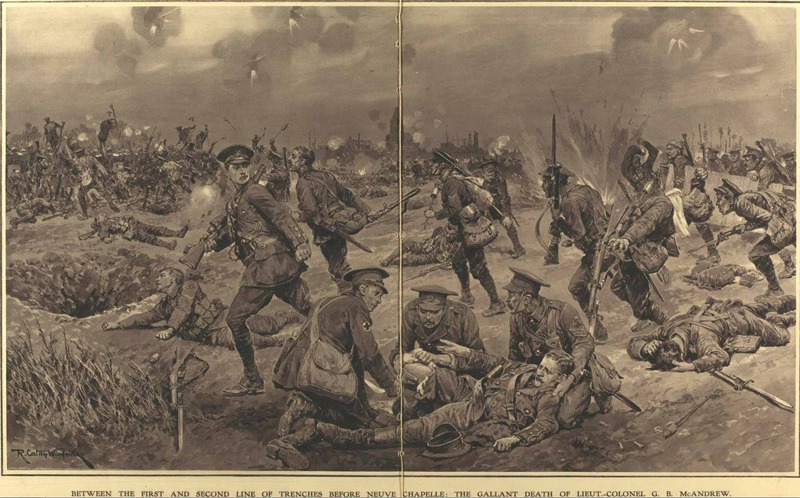 The Battle of Neuve Chapelle cost the 2nd Lincolnshire the loss of seven officers killed, eight wounded, and two hundred and ninety-eight other ranks killed and wounded.